I'm not even sure I'm going to give them 2 weeks notice. Before you start panicking that I'm leaving my family, let me reassure you that I have no intention of doing that. The job I plan to quit is the job of Chief Enabling Officer. The job mostly involves nagging, yelling, cajoling, reminding, hurrying, watching, checking, reminding, nagging, and repeat. It's a lousy job and the pay is terrible. Benefits include (but are not limited to): dependent, lazy, entitled, whiny, incompetent children. I'm sure you're wondering why I'd want to quit. Parenting is my #1 job, it's my main focus and where I put 90% of my time and energy. But honestly, it's the most important job I've never had any training for. It's a learn-as-you-go kind of gig and sometimes you find yourself heading swiftly down the wrong path. It's time to make a U-turn. I read a few books over the summer about parenting. Some were great, others not so much, but most of them were on the topic of Entitled kids- kids who feel like everything is "owed" them, should be handed to them without any effort on their part and who think life should be easy. The books contend, and I agree, that it's a major problem in our society right now. I was looking for answers on how to combat this problem in my own family, where I could put the blame, who needed to be brought back into line. The answer I found? 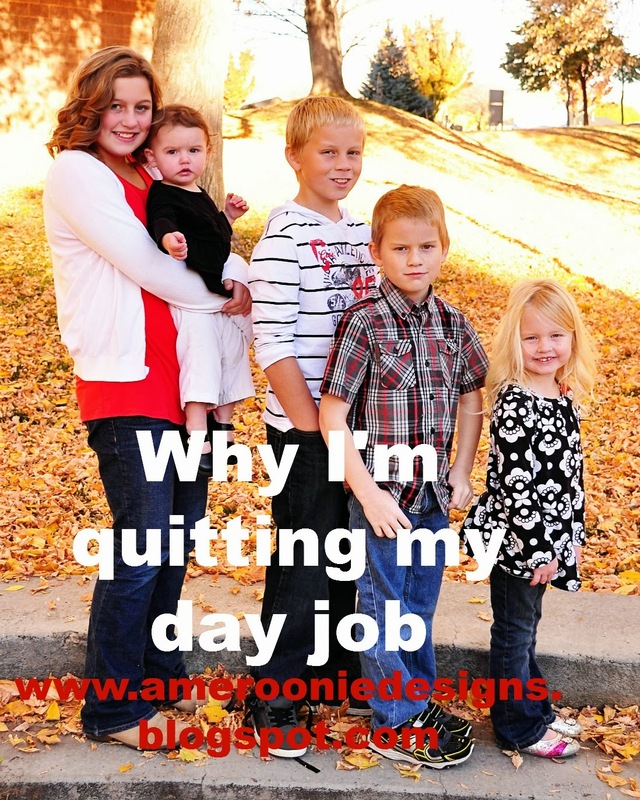 I try to give my kids responsibility, they have jobs every day. They are in charge of their homework. They are asked to help look after their little sisters so I can work. Seems like I'm doing okay, right? But when you look a little closer- sure they have jobs, but I micro- manage their execution. They should do a good job! They have to do homework, but I nag and cajole them to "Get It Done!" With one hand I give them responsibility. Tell them they can do it on their own. Promise rewards of confidence and ability. But with the other hand I pin them down. It's like giving them wings made of lead. And, I've decided to quit. It's scary. You don't want your kids to fail. You don't want them to get discouraged. You want them to be happy and safe. But wrapped up in the cocoon of our love and smothering parenting- they never learn to fly. They need to struggle and overcome to obtain the strength needed to head out on their own to new horizons. I've had moments when I've been able to let this happen, but in the day to day execution of our lives- I'm a big fat failure. Teaching staff to properly execute jobs, then allow them to work independently with minimal oversight. Communicate expectations and responsibilities along with rewards and penalties then allow staff to make decisions. Based on decisions in previous exercise, execute reward and penalty program. Confident capable children who know how to manage time, understand rewards and consequences and work independently. Warning: may also result in free time and a clean(er) home. Notes: This a difficult job. There will be much resistance from the staff as more responsibility is placed on their shoulders. There will be comparisons to other "companies" who run differently. It will require dedication and commitment to the program on your part. It may require a significant output of energy in the short term to teach and communicate. It will require you to watch your staff stumble and fall without your interference. Executing the penalty system will be much harder than executing the reward system, but it is critical they are given equal importance. Above all, it will require an understanding that you are not raising children- you are raising future adults. I'm not sure I'm qualified for the job, but I think I'm ready to give it a try. The payout is much too important to wait any longer. Do you want to join me? Or at least give me some on-the-job training? I'd love to hear your ideas and advice in the comments. Oh my dear girl, you are on the RIGHT TRACK! I applaud you! Everything you said was everything I did, too. My husband was the one who helped me change my micro-managing ways and it helped tremendously, although I didn't do it as well as I could have. It's so hard not to go ahead and do some things just because it's easier to do yourself than to teach them. But that's the problem, isn't it!! You don't need any more advice; you have the tools and the knowledge, just go for it. It won't always be perfect and it won't always be pretty, but the kids will be better for it, and you will be too. I'm cheering for YOU and the whole family! I have given this idea much thought over the last year. I have younger kids, 1st grade and down, and I want them to take responsibility for their stuff. I am not the maid. I have spent a lot of time watching mom's around me to see what they do. I am figuring out there is a lot of things I don't want to do. But one mom I am close friends with said that at her house it is a reward system. Get your stuff done, you get the reward. Like playing with friends. It makes a lot of sense, at least in the work before play idea. Then other thing I have seen around me that I like is the Seven habits for kids from Franklin Covey. I clean at a school, and they use this system for everything. And it is simple, basic, and straight forward. The biggest thing I have learned is that what works for other people, may not work for my kids. And I have no control over other's kids. (It drives me crazy to see other kids so disrespectful, using habits I don't want my kids to have.) I can't parent others kids. Just my own. And hopefully make my kids into responsible adults. Thanks for writing this post. Just what I needed to hear, to remind me to get going! I loved this post and I totally agree with you - all of you. I hope my kids grow up and don't feel entitled to everything and I hope I do something right and teach them how to be responsible. (I have a 1,3 and 4 year old.) I am perfectionist so even having them make their bed is hard for me to do (because they never get the bedspread straight! gah!!) but I have to let go and let them learn. It sounds like you are doing a great job! !